We want to ensure that each candidate has a positive experience during our application and interview process. The information below gives you a better idea of what you can expect from us. We conduct several technical and behavioral-based interviews to learn about your experience, skills and qualifications. 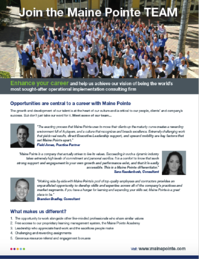 We want to learn about you, but we also want you to learn about the great opportunities that await you at Maine Pointe. Everyone is on the run these days, so we try to make our process as efficient as possible. We conduct interviews via phone, Skype video, using Hireview (a digital interview platform) and in person. As we grow, we have both current needs, for immediate openings, and projected growth needs. If we don’t have an immediate fit for your background and skills we would like to keep your credentials on file for future opportunities.